Share this product and receive a $3.60 sharing discount. This pendant is part of a new series, based on the names of Jesus. 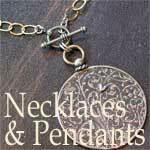 They each include a small hammered cross to serve as a reminder of our Redeemer. 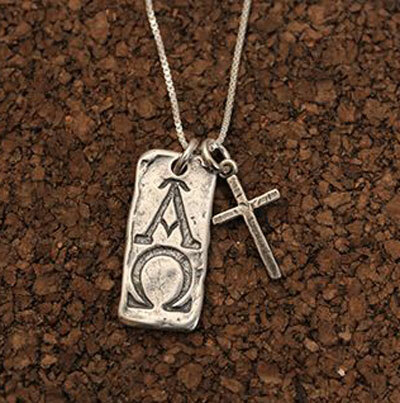 This particular one has the Alpha & Omega etched into the front of the rectangle, with the inscription "I am the Alpha & the Omega." Revelation 1:18. This series has a universal appeal and will work for men, women and children. It measures about 7/8" long by 3/8" wide. The cross is a little over 5/8" long by 3/8" wide. It comes standard on a Sterling Silver 18" mini box chain.